The 10 Best Pubs in Mississippi! A pub is a cool, comfortable place to hang out with friends and enjoy drinks and usually some great food. No matter where you live in Mississippi, there's sure to be a local watering hole close by! We've rounded up our picks for the top 10 pubs in Mississippi, so it's the perfect time to plan a night out! Tell us your favorites in the comments! At Under the Hill in Natchez, the only thing better than the great service and cold beer is the area's history. In the 1800s, Natchez was divided into the reputable bluff region and the seedy "Under-the-Hill" section along the banks of the Mississippi River. The Under the Hill Saloon manages to hold on to the nostalgia of that era while still providing a fresh and fun experience! Be sure to check their page for live music! The Porter in downtown Hattiesburg is the kind of place that somehow manages to balance being trendy and cool while still feeling extremely comfortable and inviting. They have an exciting, ever-changing rotation of some of the best local and craft brews available, plenty of cozy seating, and events several nights a week! The Blind Pig is a popular spot in the bustling college town of Oxford. They're located right in the middle of things on Oxford Square, and with 20 beers on tap, you're sure to find the draft of your choice. In addition to their regular menu selection, they also offer awesome lunch specials. Be sure to like them on Facebook to keep up with what's new! If you live anywhere around the Capitol City, chances are you've heard of Fenian's. A favorite of locals, college students, and visitors alike, Fenian's has been serving up delicious Irish pub fare, frosty beverages, and events like open mic night since 1996. And since it's an Irish pub, it's only fitting if you save a little room for the whiskey bread pudding—even if you don't order dinner. The Ole Tavern on George Street in Jackson is located in a beautiful historic building that was built in 1919. Although the location was originally a grocery store, it's been a bar and grill since 1973. They have events almost every night of the week and feature a wide selection of local artists. While you're there, be sure to ask about the ghost. 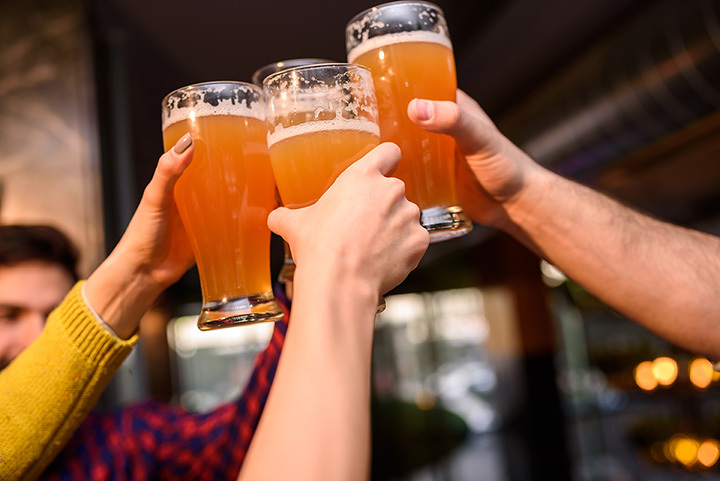 If you're on the coast and you're looking for a relaxing, casual atmosphere to have drinks and dinner with friends, you have to stop by Adventures Pub in Biloxi. Even if you're just there to have a beer, it will be hard to pass up their array of regional food, including their freshly-shucked oysters! With over 100 beers available, the Blue Canoe in Tupelo is one of the best spots in northeast Mississippi for grabbing a cold brew. The rustic atmosphere will make you feel right at home. They bring in talented entertainment from all across the region (and beyond), so you'll definitely want to visit on a night with a show! Frank's Pub & Grille is tucked away in the little town of Robinsonville, and if you weren't looking for it, you might not see it. But locals know this is the place to go when you want to get away from the Tunica casinos. Shoot a game of pool, order a specialty pizza and cheese curds, or just belly up to the bar and make a new friend or two. When you're hanging out in the heart of the Delta, Spectator's is the place to go for live music, great drinks, and delicious food. It's the kind of pub where you feel like a local even if you've never been there before, thanks to a generous helping of southern hospitality. And their music selection is eclectic enough that there's something for everyone! Martin's is a cool little spot in Midtown Vicksburg, located in a house that's 100 years-old! They have a wide variety of craft beers, and they even offer beer tastings and flights on Tuesdays. If wine is more your thing, they also have wine tasting classes on Thursdays! View more Mississippi Bars and Saloons.